Let’s clear up another common misunderstanding among golfers of all abilities. 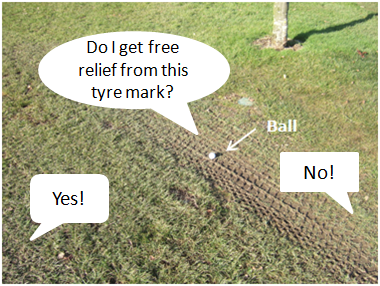 There is no free relief from tyre (or tire) tracks in the Rules of Golf, however deep they may be. Now, before you start arguing that there is, let me clarify why there is widespread confusion over this issue. When there are abnormal course conditions many Committees will correctly introduce a temporary Local Rule permitting free relief from tyre marks and other damage caused by course maintenance vehicles and equipment. Of course, the areas involved should be clearly marked as ground under repair, but sometimes this is not possible, due to the extensive nature of the damage, or because the white lines have been washed away during periods of wet weather. This temporary Local Rule was then withdrawn at the beginning of last summer, when the course had sufficiently recovered. However, it is surprising how many members think that the same relief still applies for the current 'Winter Rules', even though there is no mention of it on the current temporary Local Rules sheet, which is posted on the course notice board for all to read. Temporary Local Rules are just that – they are temporary. Players have to check them on a regular basis to ensure that they know what is permitted and what is not. On a similar subject, I have heard more than one player this winter claiming that they are entitled to place a ball that is embedded in the ground inside the margin of a water hazard because there is a notice at the first teeing ground that says, “Winter Rules – placing everywhere”. Any such notice should be backed-up by the full wording of the temporary Local Rule, which should be based on the specimen Local Rule recommended in Appendix l, Part B, 4c of the Rules book. In any case, the Local Rule should certainly specify that relief is only available for a ball lying ‘through the green’, or even restricted to ‘a closely mown area through the green’ (i.e. the fairway). If Committees fail in their duty to correctly word their Local Rules then they deserve all the criticism they will garner when players start placing their ball in water hazards, bunkers or, as I heard a few weeks ago, placing six inches away from where they had marked their ball on the putting green. Sorry to resurrect such an old post but I have a question that directly relates. Can you tell me if there's a difference btwn the tire (or tyre) tracks that you describe say from maintenance vehicles, etc., and beaten ground or hardpan that extends beyond the length of a cart path that is not contiguous throughout the hole and the course and instead ends before and feeds into the fairway? (which is quite common at my club on most holes) Please note that some of those areas that extend beyond the cart path are not just matted grass and hard dirt but also significant roots, large rocks and gravel stones. Could 1 claim that it is clearly unpaved cart path and take relief? Thank you for your insightful explanations, examples and interpretations of the rules of golf. There is no relief from the worn areas at the end of artificial cart paths that you describe, unless the Committee has defined them as Ground Under Repair. Although this may seem harsh you will appreciate that it would be unfair if players were left to decide whether an area was ground under repair, or not. Rule 33-2 makes it clear that The Committee must accurately define areas of ground under repair.